The Elmhurst History Museum opens a new exhibit this week that’s perfect for the holiday season called Hometown Holiday: It’s a Wonderful Life in Elmhurst. The exhibit, which begins on Friday, November 16 and runs through January 6, 2019, features a wide variety of rare memorabilia from the movie “It’s a Wonderful Life.” This classic movie is one of the most popular and enduring Christmas films ever produced, and the exhibit offers a behind-the-scenes look at how it was made. All of us at Elmhurst Toyota appreciate family-friendly holiday movies this time of year, and we think you’ll really enjoy Hometown Holiday: It’s a Wonderful Life in Elmhurst. The exhibit includes many rare items from the private “It’s a Wonderful Life” collection of Richard Goodson, a Chicago native. Over the past two decades, Goodson has amassed a collection that is among the largest in the world. Items on loan to the museum include original movie posters, rare photos signed by cast members and vintage collectibles dating back to the 1946 release of “It’s a Wonderful Life.” At the exhibit, you’ll also learn how the movie was made and how stars Donna Reed and Jimmy Stewart brought the characters of Mary Bailey and her husband George to life. Goodson’s extensive collection of “It’s a Wonderful Life” movie memorabilia isn’t about personal financial gain. In a 2014 interview with the Daily Herald, he explained that he appreciates how much the movie has touched the lives of those who have seen it. According to Karolyn Grimes, who played Zuzu Bailey in the film, “[Goodson is] following the movie’s theme, ‘Each life touches another.’” We’re glad that Goodson is loaning some of his collection to the Elmhurst History Museum so we can enjoy them too! The museum is enhancing the exhibit experience by adding some holiday-related items of its own. You’ll see distinctive Christmas ornaments that were handmade in Dresden, Germany. Prints by former Elmhurst resident and artist Lee Sturges will also be displayed. 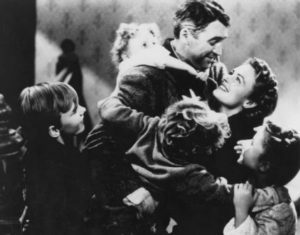 Experience the magic of this beloved holiday classic movie at the Elmhurst History Museum’s It’s a Wonderful Life in Elmhurst. Lakeside Bank is the exhibit sponsor. November 16, 2018 through January 6, 2019. The Elmhurst History Museum is open daily, except Mondays. Hours are 1-5 p.m., except Saturdays, when the museum is open from 10 a.m. to 5 p.m.